The pillage of Egypt by Sisi and Britain Inc. The twisted logic of this system protects the socialisation of the Egyptian economy in favour of a military clique, whilst condoning the wholesale imprisonment of its capitalists. Egypt completes construction of second lane of Suez Canal, July 2015. Demotix/Ester Meerman. All rights reserved. In echoes of Britain’s support of Saddam Hussein in the 1980s along with the US, and Margaret Thatcher’s thanks to August Pinochet for “bringing democracy to Chile”, Britain will host Egyptian junta leader Abdel Fattah El Sisi on a state visit in November. This follows a trip by British Defence Secretary and MP for Sevenoaks, Michael Fallon, to Egypt to attend the 6 August function for the opening of a new branch of the Suez Canal. Fallon, writing an op-ed in the local Egyptian state paper, hailed the "rejection of authoritarianism" by the régime of Abdel Fattah El Sisi, while some 46,000 of the best minds and the most active people in Egypt languish in the régime’s prisons on trumped up charges, in filthy conditions and without medical care; 176 of those are parliamentarians. Fallon towered over the slighter figure of François Hollande at the ceremony, maybe seething as French Rafale fighter-jets screamed overhead. France had been looking for a buyer for the Rafales for twenty years. Now French defence industry sales are way ahead. The $5.2bn Rafale contract signed in February effectively bails out Dassault, the French arms manufacturer. France will also relieve itself of two Mistral amphibious assault ships destined for Russia, but withheld from the western antagonist due to European sanctions, bringing $1.1 billion into state coffers from a further Egyptian deal. It seems David Cameron’s appearance in Tahrir Square in the heady days of the Egyptian Revolution in February 2011, with eight arms dealers on his retinue, didn’t pay off. Perhaps this invitation of Sisi to a state visit, extended on 17 June 2015, the day after the passing of the death sentence on incarcerated legitimate Egyptian leader Morsi, might now do the trick of squeezing yet more money out of the bankrupt country for arms sales. The delay of Sisi’s visit to London until now resulted from fear of the junta leader’s arrest on charges of crimes against humanity. As in the case of his state visits to France and Germany, Sisi’s state visit to Britain should have brought with it automatic immunity from arrest. However, the existence of a legitimate president in jail in Egypt fighting for his life complicated matters with the ongoing appeals in international capitals raised by the Egyptian Freedom and Justice Party. For example, on November 27, 2014, a High Court order forced Britain’s Crown Prosecution Service to allow British police to begin investigating and prosecuting the Egyptian junta’s war crimes, a process that has already begun to restrict the travel of certain Egyptian figures. The arrest in London this June of Rwandan general, Karenzi Karake, on war crimes charges filed in Spain was evidence that international jurisdiction cases are being effectively pursued in British courts. In the period since June, British government lawyers have been working to ensure there would be no problems with Sisi’s visit. Sisi’s scheduled visit to Johannesburg on 10 June 2015 was cancelled for similar reasons, when South African lawyers called for the Egyptian junta leader’s arrest. Unlike the British government, the South African government have not renewed the invitation. Egypt’s expulsion from the African Union as a result of the 3 July 2013 coup had been rescinded as a result of heavy pressure from the Arab Gulf states and the west on behalf of Israel. African states are now no longer under the same pressure, because the new régime of King Salman in Saudi Arabia is not such an avid supporter of Sisi as the old régime of King Abdullah. So when you watch the video of Egyptian-American activist Mohamed Soltan, emerging from Egyptian jails having been abused and tortured, urging the UK and the west ahead of Sisi’s state visit “not to remain silent and turn a blind eye to Egypt's glaring violations of international laws and conventions”, you should know that Britain Inc. is not in this case being pressured by Arab Gulf states as before, and is following what it mistakenly sees as its own immediate interests in Egypt. Fallon’s hagiography in Egypt’s state paper during the 6 August visit to the Suez Canal tells us how Sisi was about to “unveil a modern wonder”. The new 40m wide lane added onto 35 of the 192 km length of the Suez Canal would allow ships to pass in both directions, and reduce waiting times to eight hours from the current 18 hours. The whole exercise has nothing to do with commercial opportunity, but was an attempt by Sisi to shore up his damaged reputation both at home and abroad. His 6 February call for mobs to go the streets in their millions to support a new crackdown on internal ‘terrorism’ as a show of virility to the ‘international community’ at the Davos conference had been met with an unusual deathly silence. 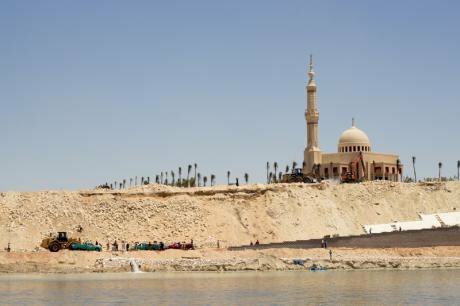 The Suez Canal project is now sinking Egypt financially. Shipping demand barely existed for the old capacity of the Suez Canal before its expansion. Furthermore, the massive $8 billion expense of digging out this channel will not qualify as a good long-term investment, in view of the fact that enterprising Chinese carriers are now braving the arctic route in the summer months to cut 13 days off the trip from the Yellow Sea to Rotterdam via Suez. The rush to build the extension to the canal as a PR stunt has had some seriously deleterious effects. Mohamed Aly-Hassan of the Kyoto Institute of Technology predicted the collapse of the Egyptian currency, as a result of the unstudied headlong dash to complete the crazy project, on his Facebook page on 18 October 2014. He points out that in its first phase the project, which had been due to excavate 341 million cubic metres of earth, hit a snag after just 40 of them, when it was discovered that the Suez Canal Authority hadn’t planned for the right sort of equipment to complete the project. This resulted in a doubling of costs, as the equipment had to be hired from foreign contracting companies at exorbitant cost. The Suez Canal project is now sinking Egypt financially. Aly-Ḥassan’s prediction was borne out when Egypt Central Bank governor, Hisham Ramez, said, a year later to the day on 18 October 2015, that the country had run out of foreign exchange as a result of the Suez Canal project. No sooner had he said that than Ramez was removed from his position and replaced with Tarek Amer, ex-head of the National Bank of Egypt (Al-Ahly) and close friend of Gamal Mubarak, the ex-president’s son. Embarrassed by this outcome to the Suez Canal project, Sisi decided to blame the collapse of the Egyptian currency on Muslim Brother leading figure Hassan Malik, who was arrested a few days ago on charges of currency manipulation. This accusation flies in the face of the fact that all of his assets had already been frozen by the state, and the 68 companies that make up his commercial group closed, as of 21 January this year. He has been more or less housebound since. Malik had not been arrested with the rest of the Muslim Brother leadership in the hope that pressure could be applied on him to back the new régime and swing public opinion. But his stubborn refusal to bend to the junta’s will has created problems for Sisi. Malik’s 28-year old son Omar was consequently imprisoned and sentenced to death along with Muslim Brotherhood leader, Mohamed Badie, in order to force the father to the negotiating table. Malik’s response to the new pressure was nevertheless and predictably negative, which infuriated the junta even more. The collapse of the currency together with the crushingly low turnout in the parliamentary elections—despite personal appeals by Sisi on TV for the population to go out and vote—has resulted in a week of panicky reactions by the Sisi junta. Mohamed Soltan had been sentenced to life in jail as part of the same batch of mass-sentencing of political opponents as Omar Malik, but was released because of his American citizenship. He has used his release to plead for Britain to reconsider its stance. But what we can take from Cameron’s recent actions is that clearly Britain Inc. is unmoved by Soltan’s video appeal against Sisi’s state visit. Immediately after the 3 July coup in Egypt, Tony Blair came out very strongly in favour of the military takeover in a TV interview. Although Blair was no longer prime minister, he remains an essential member of the establishment, having dragged the country’s main Labour opposition squarely into the conservative fold, not only on matters of geopolitics, but also on matters of neo-liberal ideology. Blair’s protected status is clear from his charmed life. Consider for instance that the Chilcot enquiry into Blair’s actions in the Iraq War has run into the sand*, while the Hutton report into the death of UN weapons inspector David Kelly has classified the evidence for 70 years. For Britain, the Morsi government and the Muslim Brothers always represented a serious obstacle. Under Mubarak, Britain Inc. was the leading foreign investor in Egypt, with BP and British Gas far and away the largest individual foreign investors in the country (Ismael and Perry 2013). A BP-led consortium had been haggling over terms for drilling the West Mediterranean Deep Water concession for years. After the exploratory phase ended, BP held out for unprecedented terms, which included direct ownership over the gas assets by the foreign consortium and accrual to them of 100 percent of the profits. The 2011-13 democratic experiment in Egypt had thrown a spanner in the works, however, with Hatem Azzam, secretary-general of the parliamentary industry and energy committee, objecting vigorously to these terms. Blair ran a consultancy brokering gas deals in the East Mediterranean region, and was directly involved in these negoatiations. The March 2014 Sharm el-Sheikh investment conference, set up to promote the road-map to democracy myth, was called by the New York Times, "abetting Egypt’s dictatorship". Its key figures and organisers were none other than Blair and Martin Sorrell, who is chairman of the British WPP advertising and public relations conglomerate, and a business partner of Blair counsellor and spin doctor, Peter Mandelson. It was no surprise that the only actual investment deal to be announced and to be signed after this essentially political event was the $12 billion contract with BP for the West Mediterranean Deep Water concession. The whole sham event had been designed around the BP deal. The failure of the Sharm el-Sheikh investment conference to bring other new business to Egypt was the major reason which led Sisi to decide on the expansion of the Suez Canal as a new PR stunt to impress the international business community. All this has backfired, as the political situation has deteriorated, while the war against the Sinai tribes, far from being resolved, has expanded. We have already seen 13 multinationals leave Egypt in recent months, while 11 further companies are threatening disinvestment, with 855 factories closing and 3500 SMEs folding since the coup. The short-sightedness of European régimes is therefore not limited to their policies in Libya and Syria. The situation in Egypt is potentially as bad if not worse. Hollande saving Dassault, Merkel saving Siemens, and Cameron saving BP/British Gas/Blair by propping up a cabal of military figures totally unqualified to run a major economy on Europe’s fringes, will blow up in all their faces on a scale they as yet cannot imagine. This junta is desperate and will resort to increasingly desperate acts to stay in power. Meanwhile, all those who are qualified to manage Egypt are either in jail or in exile. The strangest aspect of the saga is that most of the funding for the projects and for the sales of arms to Egypt discussed in this article is likely ultimately to come from European export credits. The problem for France, Germany and Britain was that European Union competition rules do not allow them to bail out their companies directly. These rules had originally been put into place precisely in order to stop a long history of bail-outs. As Winfried Ruigrok and Rob van Tulder pointed out as far back as 1995 in The Logic of International Restructuring, at least 20 companies in the Fortune 100 would not have survived if they had not been saved by their respective governments. As western economies careered into the 2007 crash, bail-outs subsequently became a fixture of the western state capitalism system. The twisted logic of this system protects the socialisation of the Egyptian economy in favour a military clique, whilst condoning the wholesale imprisonment of its capitalists. *Since writing this article a vague date has been set for the publication of the Chilcot enquiry, although the verdict is really already out.